Corrosion in refinery operations has been, and still is, the subject of many studies, papers, courses and web forums. Although a lot of what has been written shows that significant progress in understanding corrosion has been made, it also makes it clear that the problem continues to exist and that quite possibly is getting worse. It is estimated that the global costs of refinery corrosion are in the order of 15 billion USD annually. Getting more exact numbers is not possible as refineries do not make available the extent of their corrosion problems, which is understandable considering the ever increasing environmental legislation they face. It is worth mentioning that in these costs, profit losses and loss of production uptime have not been taken into account. An analysis report by NACE International states that in the USA alone annual profit losses due to refinery corrosion may be as high as 12 billion USD! Despite extensive research and vast amounts of available literature, many of the corrosion mechanisms are not yet fully understood. The problem with petroleum refining is that there is not one single source of corrosion, but many. To add to the problem, some of the corrodents might interact and increase or inhibit each other’s corrosivity. Also, physical process conditions play a role; so temperature, flow and Reynolds number have to be taken into account too. Of no less importance is the refinery infrastructure itself. Pipes, vessels, weldings, instruments, etc. are obviously also part of the equation. Given the number of variables then, it becomes clear that corrosion is a complex problem. One reason why the situation is not expected to improve soon is the increased processing of low quality sour crudes. Sour crude is crude oil with a high sulfur content (as opposed to low sulfur containing “sweet” crude). Because it provides a lower feedstock cost, sour crude is preferred by refineries for economic reasons. Further, sweet crude is becoming less readily available as the bulk of its supply is exhausted. In sour crude, sulfur is present in the form of mercaptans, H2S, sulfide salts, elemental sulfur and so on. Many of these species are reactive and cause sulfide stress cracking and sulfuric acid corrosion throughout the refining process. Besides sulfur, crude contains many species that are quantified by the total acid number (TAN) of the oil. This number is not specific to a particular acid but refers to all possible acidic components in the crude, and is defined by the amount of potassium hydroxide required to neutralize the acids in one gram of oil. Typically found are naphthenic acids, which are organic, but also mineral acids, H2S, HCN, CO2, etc. can be present, all of which can contribute significantly to corrosion of equipment. Even materials suitable for sour service do not escape damage under such an onslaught of aggressive compounds. Again, because of cost considerations, a trend towards a preference for crudes with a higher TAN is noticeable. Desalting of the crude is the first step in refining that has a direct effect on corrosion and fouling. By mixing and washing the crude with water, salts and solids transfer to the water phase which settles out in a tank. An electrostatic field is induced to speed up the separation of oil and water. In this way, inorganic salts that could cause fouling or hydrolyze and form corrosive acids are largely removed. Often, chemicals are added in the form of demulsifiers to break the oil/water emulsion. Also, chemicals such as caustic soda are introduced to neutralize acidic components. Uncontrolled feeding of caustic can, however, have a detrimental effect. An excess of caustic can result in the formation of soap due to, for instance, the presence of fatty acids. Soap stabilizes the oil water mixture and obstructs the separation process. Also, too strong a mixing of crude and water can create an emulsion that is very difficult to break. Frequently the crude arrives at the refinery as an emulsion due to the presence of water that had been used to maximize the oil extraction from the oil reservoir, or water might have occurred naturally in the reservoir. It can happen that emulsions are too strong and prove impossible to break. When this is the case a lot of the contaminants end up in downstream processes, which may have serious consequences. One process parameter that can play a vital role in both neutralizing acids and demulsification, is process pH. Carefully monitoring pH in the desalter water effluent allows for efficient dosing of caustic or acid which may result in significant cost savings. The stability of the oil / water emulsion depends partly on pH. Maintaining the pH of the mixture within a certain range helps the demulsifier chemicals in breaking the emulsion by interacting directly with the water droplets. The speed and quality of the separation process can thus be improved which leads to less water carry-over, which in turn can result in a significant reduction in downstream corrosion and fouling. Despite a good desalting operation, an abundance of corrodents can still appear during downstream processing. A good example of this is the sour water corrosion that occurs in the crude distiller. During the process lots of acid gases are formed of which hydrogen sulfide is notorious. Steam, which is injected into the crude tower to improve the fractionation, condenses in the upper part of the unit. The hydrogen sulfide dissolves in the condensate and forms a weak acid which is known to cause stress corrosion cracking in the top section of the tower and in the overhead condenser. This may lead to frequent retubing of the condenser and in severe cases to replacement of the entire crude tower top. Although this particular cause of corrosion is well known to refinery operators, counter measures are not always in place. Typically, corrosion inhibitors and lots of neutralizers such as caustic soda or ammonia are injected with the aim of increasing the pH of the sour water. Although this is an obvious response to the problem, the cure can be worse than the disease. The presence of various acid gases and ammonia can result in solid salt depositing from which ammonium bisulfide is one of the main causes of alkaline sour water corrosion. pH levels higher than 7.6 dramatically increase ammonium bisulfide corrosion. By overdosing caustic that level is easily achieved. Hence, as in desalting, the key to corrosion reduction is in accurate pH control. Proper neutralizer dosing through crude distiller overhead condenser boot water pH measurement will not only reduce corrosion but also reduce chemical consumption. Reductions in the use of corrosion inhibitors of more than 15 % have been reported. Besides the crude distiller many other downstream operations involve sour water and accordingly suffer from corrosion issues. Few design engineers actually schedule pH control facilities in any of these operations. This seems odd and was indeed not always the case. In fact many units are or were at a certain stage equipped with pH control loops. However, when it comes to reliability, most pH analyzers show an extremely poor track record in refinery sour water environments. Not specifically designed for refinery applications, most pH electrodes suffer from poor performance in the presence of high sulfide levels and the substantial hydrocarbon load. As maintenance personnel and manufacturers are often unable to solve these problems, the majority of pH analyzers in these “less standard” applications are ignored by operators. When conducted properly however, proper pH control results in sizeable earnings. Not only because of a reduction in chemical consumption and equipment corrosion, but also thanks to the extension of the period between maintenance shut-downs and the resulting additional operating days. Though available in endless varieties, virtually all pH electrodes have difficulties with the hostile environment present in sour water applications. 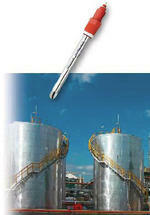 The most common cause of sensor failure is poisoning and fouling of the reference electrode system. Sulfides diffuse from the process side into the sensor and react with the silver / silver chloride reference electrode, changing the electrical potential at the reference side. This causes drift of the pH measurement. Oily substances and solid contaminants may coat or clog the diaphragm of the reference junction which obviously has a negative impact on the sensor performance as well. In order to overcome these problems, sensor manufacturers have been very creative in their choice of reference diaphragm. Now it is possible to find pH electrodes with a ceramic, plastic, rubber or even wood reference diaphragm. The issues they all share are that in sour water applications their performance can be severely limited (some may fail immediately), their maintenance requirement is high and their lifetime short. For a long time, pH electrodes with a flowing reference junction have been giving superior results. A flowing reference is obtained by pressurizing the electrode. The overpressure forces liquid electrolyte through the diaphragm into the process. This outgoing flow of electrolyte slows down the diffusion of poisoning substances into the sensor’s reference system and retards fouling and clogging of the diaphragm. These types of electrodes such as the InPro 2000 i from METTLER TOLEDO are an excellent choice for petroleum refinery applications. They do, however, require frequent refilling of electrolyte, which from a maintenance point of view is not always acceptable. METTLER TOLEDO has acknowledged this issue and has designed the InPro 4260 i pH electrode with Xerolyt® Extra solid polymer electrolyte. The InPro 4260 i has an open junction, which is in fact a hole that brings the solid electrolyte in to direct contact with the process medium. Contrary to the miniscule capillaries of any other type of diaphragm in conventional pH electrodes, the diameter of the open junction is extremely large and much less susceptible to clogging or fouling. Another significant difference is in the choice of polymer electrolyte. Xerolyt® Extra has been designed specifically for service in hydrocarbon environments and provides a strong and lasting barrier against sulfide poisoning at the same time. Despite innovative design, even the best pH electrode needs frequent maintenance. Of any process instrument, the pH electrode probably has the widest rangeability and an extraordinary sensitivity that covers it. Depending on the process application, after a certain time in operation a calibration is required to make sure the instrument will maintain its reliability and accuracy. Obviously its service in the previously discussed sour water applications is about as tough as it can get. So no matter how good the sensor is, the need for cleaning and calibrating will occur more frequently than in a boiler feedwater application, for example. Experience shows that on many occasions, manual cleaning and calibrating every two to four weeks will suffice. When very sour crudes are refined however, or when the overhead hydrocarbon / water separation is not optimal, sensor maintenance may be required to an extent where it becomes problematic and the value of the measurement is no longer considered an asset. In such applications the implementation of an automated cleaning and calibration system is the answer. 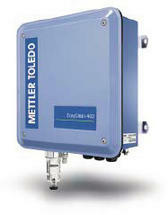 Proven to be of great value in numerous “dirty” applications is METTLER TOLEDO’s EasyClean 400 system. Fully certified for use in hazardous areas, this unit enables the most difficult pH measurement tasks. When necessary, EasyClean 400 pneumatically retracts the electrode and gives it a thorough cleaning followed by a two-point calibration, without any human intervention. The standalone unit carries cleaning and buffer solutions on board and requires no more than instrument air and water supplies to carry out its tasks. An extra valve is available in case an additional cleaning liquid is needed. For instance, in petroleum refinery applications, naphtha is often used to remove organic fouling from the sensor surface followed by nitric acid as a secondary cleaning agent to remove corrosion products such as iron sulfide. Using EasyClean 400 greatly extends sensor life and allows virtually one hundred percent measurement availability without compromising reliability. Maintenance activities are limited to an occasional sensor replacement and refilling of the cleaning and buffer solutions. Since only minimal quantities of liquid per cleaning / calibration sequence are used, and EasyClean 400 is equipped with 3.5 liter canisters, refilling should be a rare event. In the end, all pH electrodes will show signs of aging and performance will start to fall below the reliability required. METTLER TOLEDO pH electrodes with Intelligent Sensor Management (ISM) communicate their remaining operating life through a digital signal that also carries measurement values, temperature and enhanced sensor diagnostics. Based on actual process conditions and history, the Dynamic Lifetime Indicator will predict when sensor replacement is due. This is one of many interesting features of the ISM platform that truly enables predictive maintenance. Corrosion costs the world refinery industry billions of dollars annually. Although one of the major contributors to corrosion is the pH value of process water, pH measurements in oil refinery service have acquired a bad reputation due to their poor ability to measure in the aggressive environment they have to contend with. When the correct equipment is chosen however, in-line pH measurement and control facilities have proven to be of great value in reducing plant-wide corrosion, and the consumption of chemicals such as pH control reagents and corrosion inhibitors. This not only results in significant cost savings but also in increased earnings through increased process uptime. Advances in sensor technology and intelligent automation of the measurement point, enable pH measurement in the most challenging refinery sour water environments. From that perspective an investment in pH control is highly recommended. The gain in refinery operating days and substantial savings allow for quick pay back of the pH control loop. Furthermore, partly eliminating one of the variables from the complex corrosion equation is a leap toward better understanding of the corrosion mechanism. 3Thermal Properties of Polymer Materials at a Glance!